Now, during any long trip or travel, you can forget about the construction of huts, this is no longer necessary. Camping Tent addon is 16 painted tents designed for overnight stays in cozy conditions. Tents can be easily installed and require the same crafting components as any bed. 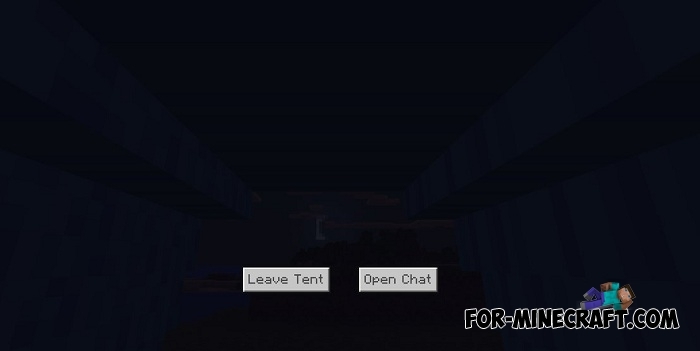 When you get inside the tent you will see the updated buttons. If you want to complicate survival and turn Minecraft Bedrock into a simulator of the apocalypse then pay attention to the DayZ addon. These tents will surely come in handy to you as well as weapons and armor there. How to install the Camping Tent addon?